Arctic Cannon Larvae (ユキフタクチ?, lit. : "Snow Top-Mouth") are enemies in Pikmin 3. They are bright green, with a lavender underbelly, and a variant of Armored Cannon Beetle Larvae accustomed to cold conditions. Unlike their rock-spitting relatives, Arctic Cannon Larvae launch giant snowballs. While mostly equivalent to boulders in functionality, snowballs are incapable of killing Pikmin, instead simply picking them up and carrying them along until they crash into something (even other snowballs); Winged Pikmin won't even be picked up by the projectiles, only knocked back. Leaders will be picked up as well, which also traps them until the snowball is destroyed. 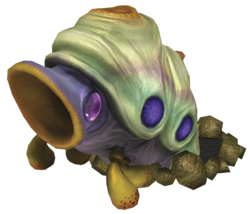 As a result, the creature is annoying at best, and is only a threat if the Pikmin it rolls away end up next to some other enemy or hazard without the player noticing, but can be killed with relative ease by any Pikmin type. The Arctic Cannon Larva will either emerge from the ground when a leader or Pikmin is extremely close to it, or it will emerge from a distance and consistently shoot snowballs to hinder the group. In most cases, it will behave the former way, and only a few, notably used in puzzles at the Distant Tundra, will perform the latter. In all cases, the Arctic Cannon Larva behaves the same up-close; it will try to roll its attackers away with snowballs and buck any Pikmin off if they latch onto it. During a battle, it will likely burrow underground, or attempt to, as many times as it can, and when it re-emerges, any leaders or Pikmin standing above will be launched into the air and temporarily immobilized. Although harmless, the Arctic Cannon Larva can be quite the nuisance. Any Pikmin type can be used to take it down. Simply charge at the lithopod with your squad and, with time, it will be defeated. Although all Pikmin can get shaken off by its bucking attack, Winged Pikmin are immune to its snowballs, making them slightly more effective for long battles. To maximize the offensive output, send only a few Pikmin to attack it, and when you realize that it's getting ready to buck them away, send the remainder of your Pikmin to charge at it. This will cause them to attack while the creature is busy blowing a snowball, giving more time for the Pikmin to attack without getting shaken off. With a name similar to the Armored Cannon Larva, this enemy is called arctic because it lives in cold environments, and is themed around snow. In Japan, it is called ユキフタクチ?, which is the same as the Japanese name of the Armored Cannon Larva, but starting with ユキ? (lit. : "Snow"). Internally, it is considered the same enemy as the Armored Cannon Larva, so it shares the same internal name, but when it needs to be disambiguated, its name is yuki, which means ユキ? (lit. : "snow"). Yuki Futa Kuchi "Snow Top-Mouth". "ユキ?" means "snow", "ふた?" means "top", and "口?" means "mouth". A close-up of an Arctic Cannon Larva in the Distant Tundra. Side view of the Arctic Cannon Larva. Close-up of an Arctic Cannon Larva shooting a snowball. Winged Pikmin fight an Arctic Cannon Larva. Rock Pikmin fight an Arctic Cannon Lava. This article was a featured article from June 1st, 2015 to August 1st, 2015. This page was last edited on April 6, 2019, at 11:24.